‘You’ll work yourself to death’ – a familiar phrase to many an ambitious individual. Many of us do it: we work long hours, often well over what we’re contracted for. We do it because we care about our work and because we want to succeed; we work tirelessly to secure our future and to provide. But climbing the corporate ladder takes commitment and time. Missing social events with loved ones and working during precious weekends and holidays are often part and parcel of getting ahead. And while this is the norm for many across numerous countries and industries, what is not the norm is literally working yourself to death. Sadly, such is the case in Japan, where death by overworking happens so frequently, it even has its own name. Karoshi, as the phenomenon is called, was first coined in the 1970s, during a period of rapid growth in Japan’s post-war era. And though Japanese society has changed in many ways since then, one aspect that remains largely intact is its work culture. Leaving the office before your boss, for example, is still considered bad form. The onus on a man to be his family’s sole breadwinner continues. And a strict hierarchical corporate structure endures, with those in the upper echelons often staying in their posts for decades, affording little opportunity for youngsters to advance. “The Japanese labour market is a pressure cooker because, first of all, it is very hard to get into a top firm – have you seen how many young people at top universities in Japan have stress-related eczema?” asked Frances McCall Rosenbluth, a professor of political science at Yale University. Each year, hundreds of deaths in Japan are linked to karoshi, and while they range from suicides to strokes and heart attacks, the root cause is the same. Of late, a growing number of sad tales are grabbing media attention – not just in Japan, but also further afield. Among the most high profile is the story of Matsuri Takahashi, whose monthly 100 hours of overtime for advertising giant Dentsu pushed her to commit suicide at the age of 24. Another fatality that sparked outrage was that of 31-year-old Miwa Sado, who experienced heart failure following a month in which she logged a shocking 159 hours of overtime with public broadcaster NHK. In light of such revelations, in October 2016 the Japanese Government published its first white paper on the subject. According to the study, 22.7 percent of companies surveyed had employees that worked more than 80 hours of overtime each month – the official threshold after which there is a chance of karoshi. Indeed, as many as one in five workers in Japan are currently at risk. What makes this situation all the more unnerving is the paradox that exists in the Japanese labour market – namely, the tendency to overwork despite job shortages as a result of the country’s shrinking population. “You might expect workers to be able to demand better working conditions, including shorter hours, from their employers,” said Janet Hunter, Saji Professor of Economic History at the London School of Economics, who specialises in Japan. Efficiency is also sacrificed as a result. 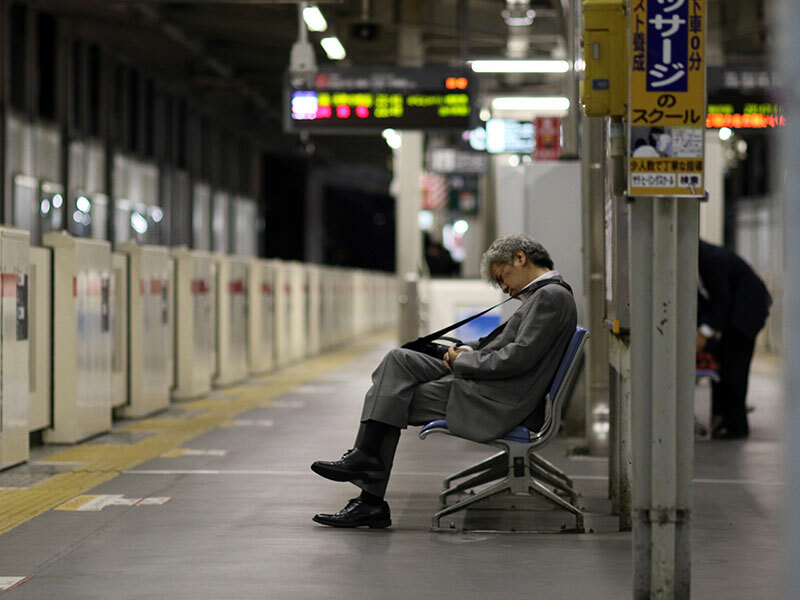 It is no coincidence that, despite having some of the longest working hours in the world, Japan also has an exceptionally low level of productivity – in fact, the lowest among G7 countries, according to the latest data from the OECD. In 2014, a new law was introduced in Japan, making it the state’s responsibility to take steps to reduce the incidence of karoshi. But according to The Japan Times, this legislation does not actually include penalties to companies that allow overworking past the 80-hour threshold. As such, the largely symbolic gesture has had little impact. With stories proliferating, greater action has become imperative. Soon after Takahashi’s death, the government introduced Premium Friday, an initiative that gives employees the chance to leave at 3pm on the last Friday of every month. But with monthly finances and sales targets wrapping up for month-end, those taking advantage must simply work more hours to make up for that lost afternoon. Some companies are taking matters into their own hands. There are those, such as Dentsu, that now turn the lights off at 10pm. The advertising firm also offers breakfast to those that come in early, in another bid to deter individuals from staying too late. Change must come from within. Every firm – no matter its size – needs to take heed of the dangers their employees face and enforce strict rules that forbid them from excessive overtime. This also entails creating new opportunities for young people, paying particular attention to women. Greater job security will further reduce the risk of karoshi. Workers, in the meantime, can take a stand, outlining from the start that they will not put up with unspoken requirements to work obscenely long hours. Perhaps a nod to productivity will better prompt responsible parties to take the steps necessary to abolish karoshi once and for all. A working culture in which young employees are expected to stay until their superiors have left – in which few are given the opportunity to progress, and job security is not guaranteed – results in undue pressure and ultimately poor productivity. Working excessively does not do anyone any favours – not the firm, and certainly not the individual. But recognising the benefits of promoting efficiency over hours spent in the office could have a mammoth impact on a company’s success, as well as on the Japanese economy as a whole, while, most importantly, saving countless lives in the process.